When cruising the open road, you don’t always have a direction or destination; that’s just part of a biker’s life. With the streets forever changing, you must be prepared. Look for protection with the Marksman flannel jacket. A jacket as rugged as your grandfather, yet, tailored with a classic innovative design that won’t let you down. Stay protected, be stylish, and hit the mark. We checked the fit on these jackets with our size mannequins and we also spot checked a few different size jackets with a tape. We feel this model runs true to size. The jackets are sold in ordinary “alpha” sizes, so you can choose the size you normally wear in men’s clothing. For those that want to check the size based upon their chest measurement, we put together the chart below. This chart shows the chest size ranges for each jacket and max belly. The taper on the jackets is very mild, so most people (even those with a bit of a belly) should easily find a fit. Just make sure the size you choose will be big enough for both your chest and belly. if you have a more athletic build (big drop from chest to belly size), then this one might not be a good choice since there isn’t any adjustability on the fit of the waist. Average to stout people should find an easy fit. 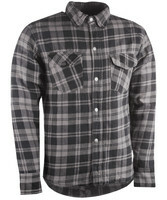 Here a pretty nice flannel shirt from Highway 21 that has the basics for the motorcycle. This shirt has Kevlar reinforcements, armor and a gun pocket. The shell of this shirt is basic cotton flannel, so I don’t think I have to remind you that if you fall, the shirt will shred pretty rapidly. But to beef up the shirt and provide a little bit of impact and abrasion protection, this shirt has a layer of Kevlar fabric behind the flannel in the shoulder and below areas. It is also fitted with CE molded protectors as well. And there is a simple foam back pad too. The shirt has a row of snaps in front, but behind that is a zipper which is a basic necessity to keep the shirt from just flying open if you fall. I’ve seen better reinforced riding shirts, but for the price range, this setup stacks up well.